Two years ago, when Trap began its rapid ascent towards dominating not just Hip-Hop, but infesting many associated genres, the freshness of Rap with labyrinthian-like flows and in-your-face hi-hats was an exciting and invigorating next step for Hip-Hop in the mainstream. Unfortunately, it worked. Really, really well. Taking into context our current culture, Trap's bloated dominion may be the most excessive for any genre of music ever. It's inescapable, considering how much artists like Future (Future, Hndrxx) and Young Thug (Beautiful Thugger Girls, Young Martha) release over the course of a year. Quality over quantity is no longer a contentious debate, especially for those two, who denounce releasing good material whilst promoting the importance of brand awareness. If their namesake is in the mouths of social media users, the minds of listeners, they'll maintain relevance. And that's all that matters. That's all Super Slimey is. It seems as if every run-of-the-mill Trap album has received the same condemnation from me in the past year. 2 Chainz' unanticipated Pretty Girls Like Trap Music excluded. There's no drive left, no incentive to one-up your opponents. On Super Slimey, Future and Young Thug unite for 13 more tracks that'll soon be forgotten in the sea of music consumption. They come and go, formulaic and derivative, offering no alternative ideology to the one that's currently successful. If you're familiar with Future or Young Thug you'll know exactly what to expect. Their flows, one syrupy one screechy, abide to their exact stereotype. Their content, one boaster one slapdash, does the same. The production fairs no better, arriving at the same, conventional conclusion regardless of who's behind the boards. Insincere love ballads like 'Real Love' or 'All Da Smoke' occasionally enter alongside the traditional braggadocio of 'Three' or 'No Cap,' diluting both of their value in the process. Ultimately, there's very little deemed necessary here. Super Slimey, as an album or, more accurately, a piece of art, seems entirely meaningless. There's nothing offered that hasn't been before, by Trap as a whole or these very rappers. It's hard to see this mixtape as anything but a cash grab selling high on the streaming age. 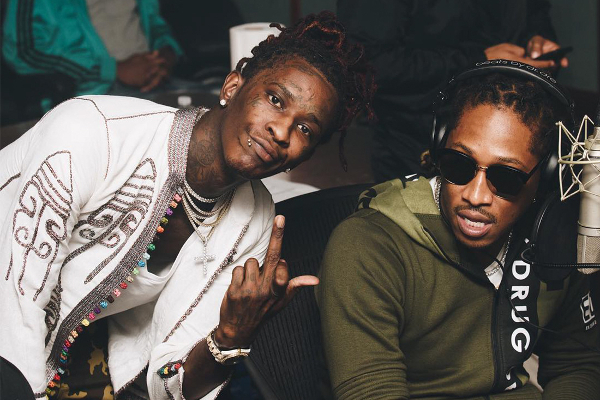 Hearing track after track Future and Young Thug have conceived over the year, it's damn near impossible to picture them actually enjoying the music they're devising. It seems as if 'Killed Before' and 'Group Home' are the only moments that aspire to be something more than pandering drivel. The former, featuring only Young Thug, feels like an outtake to Beautiful Thugger Girls, what with its pseudo-disheartened guitar and Thugger's over-exaggerated falsetto. The latter a fairly focused effort on each rapper's origin story, speaking on behalf of those closest to them. Seek out 2 Chainz' 'Riverdale Rd' or 'Burglar Bars' for better examples of what 'Group Home' aspires to be, because even Super Slimey's best moments are nothing more than mediocre.